A while back, Ben Henshaw of Indigo Wine sent me some samples to have a look at. Ben and I agree pretty much in terms of our palate preferences, I’ve found, and so it’s always good to taste things that he’s unearthed. He seems to have an amazing talent for finding great producers, and sometimes I’ve even been able to introduce interesting people to him, and he’s ended up importing their wines. Two of the wines were from Portuguese winemaker Tiago Teles, who started out as a wine critic, then moved to making wine. And last week I was in Portugal and I met up with him, without realising I’d already tried his wines. So it’s great to have made that connection: I love this sort of serendipity. 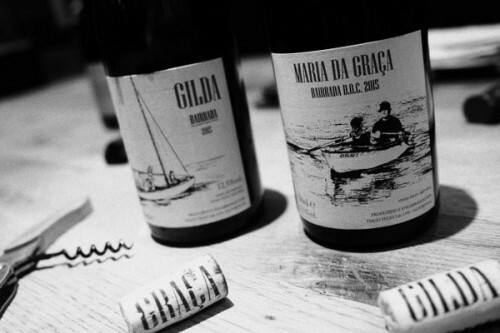 Tiago works quite naturally, and he started out in Bairrada, where both these wines come from. He’s since branched out to other regions in Portugal. Tiago found several small plots mainly on clay-limestone, sandy soil in Bairrada. This pair of wines was fermented in a small 600 litre stainless steel lagar in a friend’s cellar, and the grapes were foot trodden and fermented with wild yeast. There’s minimal use of sulfur dioxide. Portugal needs more wines like these. They are genuine.